Bad habits can take a toll on a budget. Whether you are trying to save money or get out of debt, a bad habit can be costly to your budget each month. 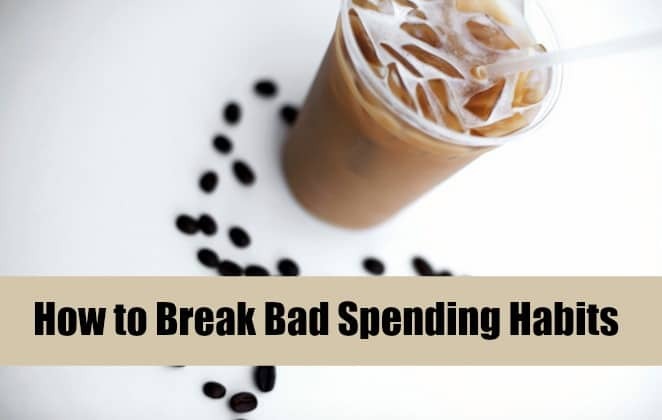 As part of the 30 days of Money Management Tips, today I wanted to discuss bad spending habits you need to break. Back in the fall, I wrote about my Starbucks coffee addiction. I was spending around $80 a month on my coffee habit. I was falling into a bad routine and finally caught myself! The pattern was identical every work day; I would take the bus to work and always arrive 20 minutes early. To kill time, I would stop at Starbucks that was located between my bus stop and my day job. I would mindlessly grab a coffee and continue on to work. Breaking my Starbucks coffee budget was tough! I tried to justify my daily purchase but couldn't handle seeing how much money was coming out of my bank account towards coffee. The hardest part of changing my habit was not giving up the coffee – I drink coffee at work! – but the habit of walking into Starbucks. I was so used to the daily repetition of my walk that it felt completely different once I made the change! I decided to reduce my Starbucks spending and limit myself to a couple of coffees a week. About a month later, I had reduced my Starbucks spending to purchasing one coffee a week. I have now been in this habit for the past couple months and have actually stuck to it! First you need to be open minded about your bad habit. It can be hard to admit to weaknesses, but once you can recognize you have a habit, it will be easier to move forward and find a solution. Next you should try to figure out why you have a habit. For me, going to Starbucks was used to fill in the time between my bus arrival and starting work. It wasn't necessarily even about the coffee! Determine if it's a need or a want. I definitely didn't need to stop for a coffee every day before work! But now that I have my spending under control, I figured out that I would like a coffee from Starbucks once a week as a treat. Plan ahead or give yourself an allowance. It is much easier to plan on spending $3-$5 a week on coffee than spending $20 a week. By planning ahead, I have control over my finances and stick to a budget. Plus now I really look forward to my coffee treat! Join thousands of other people who have grabbed this FREE side hustle cheatsheet and start earning extra income. Do you have any bad spending habits? Your tips are super helpful and practical. It is amazing how much money we spend mindlessly. I have trimmed a few regular bills and am putting the difference into savings each month. I will be excited to see how much I can save at the end of the year. Ooh, can’t wait to see how much you save!! Go you for breaking that habit. And I like that you figured out a way to make it more likely for you to stick to it — some people do well with really draconian “I won’t at all” vows, and some do better reorienting about “once a week.” I’m in the latter camp myself 🙂 I still buy coffee at work most days in the afternoon, but I switched from Starbucks to Au Bon Pain and have been bringing my own mug, which together have reduced my costs from a little over $2 a day to more like $1.25. It helps! The coffee was the hardest habit to break! That’s awesome you could cut your budget almost in half. That makes a huge difference! I think it’s generally all of those small purchases that add up which kill your budget. Going to lunch during work can be super expensive after one week. And that’s not to say packing is the most economical solution because lunch meat is expensive too. Finding lunch specials for us like 2 slices for $2 on Wednesday or free badge Fridays was a huge savings. So that meant weekly lunch was decreased from $20 to $12. One of mine is hummus. I can make my own, but I LOVE trader Joe’s Mediterranean hummus so much. That’s one habit that can save me a lot of money if I break.